Initially it was billed by President Donald Trump's administration as an Iran-focused meeting, but the organizers significantly broadened its scope to include the Israeli-Palestinian conflict, the fight against the Islamic State group, Syria and Yemen. The shift was designed in part to boost participation after some invitees balked at an Iran-centric event when many, particularly in Europe, are trying to save the 2015 Iran nuclear deal after last year's U.S. withdrawal and re-imposition of sanctions in its self-described "maximum pressure campaign." While Israeli Prime Minister Benjamin Netanyahu and U.S. Vice President Mike Pence will attend along with Secretary of State Mike Pompeo and his counterparts from numerous Arab nations, France and Germany are not sending cabinet-ranked officials, and EU foreign policy chief Federica Mogherini is staying away. Russia and China are not participating, and the Palestinians, who have called for the meeting to be boycotted, also will be absent. Iran, which is celebrating the 40th anniversary of its Islamic Revolution this week, has denounced the meeting as a "circus." "We think we will make real progress," Pompeo said. "We think there'll be dozens of nations there seriously working towards a better, more stable Middle East, and I'm hoping by the time we leave on Thursday we'll have achieved that." He did not, however, offer any details about specific outcomes. 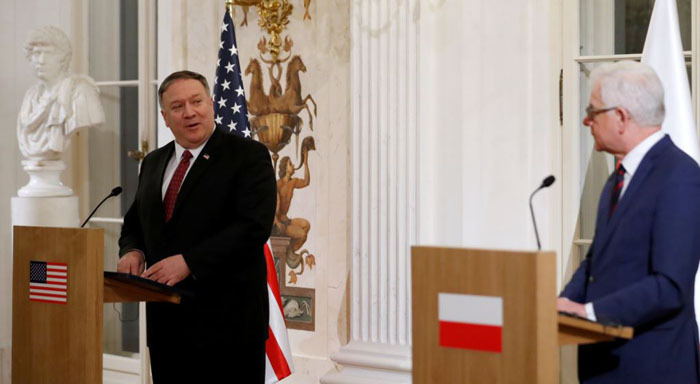 In a joint opinion piece published Wednesday by CNN, Pompeo and Czaputowicz said they did not expect all participants to agree on policies or outcomes but called for an airing of unscripted and candid ideas. "We expect each nation to express opinions that reflect its own interests," they wrote. "Disagreements in one area should not prohibit unity in others." On his way to Warsaw, Netanyahu made clear he believed the conference is centered on Iran. "The focus is Iran," he told reporters. "Iran threatens us on the 40th anniversary of the revolution. They threatened to destroy Tel Aviv and Haifa, and I said that they would not succeed, but if they try then I repeat that this will be the last anniversary of the revolution that they celebrate, this regime." "We expect to see again this week an American approach to Iran that will showcase our alienation," it said in a statement. "More than merely embarrassing, the administration's stated 'maximum pressure' approach is incoherent, as America lacks allies willing to support such a strategy. Not a single EU country has endorsed pulling out of the Iran deal, unsurprising given that the Trump administration's own intelligence chiefs testified earlier this month that Iran remains in compliance."